Kerry qualified for a fifth successive All-Ireland MFC final with a dramatic win over Monaghan. Kerry led by 0-10 to 0-06 at the interval, with Dylan Geaney hitting five points, and a David Mangan goal early in the second half put them in control as they led by nine at one stage. Despite the dismissal of corner-back Conor Flannery, the Kingdom held on for a slender win, however they were made to work very hard for it by a determined Farney. Jason Irwin and Mark Mooney fired in Monaghan goals, but late scores from Paul Walsh and Jack Kennelly clinched it for the Munster side. 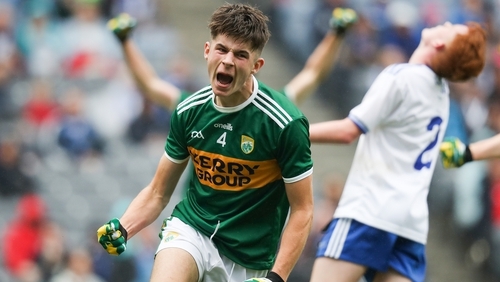 Kerry appeared to be coasting to a comfortable victory with a nine-point lead, but a furious Monaghan comeback set up a gripping finish to a richly entertaining Electric Ireland All-Ireland MFC semi-final at Headquarters. The Kingdom had a man sent off midway through the second half, and as Monaghan swept forward to grab two goals, they had to come from behind to secure their place in the decider. Having won the last four Tom Markham Cup titles, Kerry are well placed to continue this dominance at the new U17 grade, with Galway standing on their way on 2 September. Kerry were motoring from the off, with Dan McCarthy and Darragh Rahilly steering over points, and the quick-thinking of Patrick D’Arcy almost caught out goalkeeper Ryan Farrelly, who had to scramble to push away a cheeky effort. Even Monaghan’s double sweeper system couldn’t negate the slick movement of a talented Kingdom attack as they crafted scores for Killian Falvey and Dylan Geaney, who landed a gem from out on the right. Aaron Monaghan kept the Ulster side in touch with a couple of scores, but with Owen Fitzgerald operating effectively as sweeper, the Munster champions were set up to deal with most of what came their way. Paul O’Shea and Darragh Lyne dominated possession around the middle, and the scores just kept coming, with Geaney tormenting the Farney rearguard as he shot his fourth point to open out a six points lead. But Monaghan found a way to live off scraps, and late in the half, pulled back scores through Jason Irwin, Mulligan and Loughlin Power to trim it back to three. Kerry led by 0-10 to 0-6 at the break, and less than three minutes into the second half, struck for a goal, defender David Mangan getting on the end of a breakaway move to take Michael Lenihan’s pass and slide a low shot to the net. Monaghan posted another positive response with three converted frees from Sean Jones, and the Kingdom were reduced to 14 men for the final quarter when defender Conor Flannery was shown a black and then a red card, having earlier been booked. Monaghan stepped up the tempo and got in for two goals in the space of three minutes. First Darragh Dempsey sent Irwin in for a low finish past Marc Kelliher in the 54th minute, and the sides were level in dramatic fashion when substitute Mooney sent a brilliant angle strike to the net. Donnacha Swinburne gave the Ulster side the lead for the first time in stoppage time, but Walsh levelled from a free, and knocked over the lead point, before substitute Jack Kennelly clinched it. Kerry: M Kelliher; C Flannery, O Fitzgerald, D Mangan (1-00); C Moriarty, D McCarthy (0-02), D Murphy; P O’Shea, D Lyne (0-01); D Rahilly (0-03), P Walsh (0-03, 2f), K Falvey (0-01); D Geaney (0-05, 2f), P D’Arcy, M Lenihan. Monaghan: R Farrelly; R Grimes, J Doogan, S Hanratty; C Flood, B Og O Dufaigh, M Meehan; J McGarrell, A Moore; A Mulligan (0-04, 1f), S Jones (0-04, 4f), K Gallagher; D Swinburne (0-01), L Power (0-01), J Irwin (1-01).